Arsenal's Mesut Ozil says he is flattered by comparisons to Dennis Bergkamp but insists he has his own style. The forward celebrated his 200th appearance for Arsenal with a goal in their 2-1 win over Newcastle on Saturday. Ozil signed a three-and-a-half year contract in January that made him the highest paid player in the history of Arsenal. The 29-year-old has been compared to Dutch legend Bergkamp, who won the league three times during his time in north London, but Ozil said he wants to be remembered for his own style. "The fans have backed me ever since I arrived five years ago and because of that, I've been able to play in my preferred style," he told the club website. "I always want to control the game, give assists and help my team. It was like that with me from the start. In my position, you have many possibilities playing forward. You can demand the balls, make telling passes or score yourself. "I've been told so many times over the years that this is how Bergkamp played. Of course, that makes me proud and it is an honour to be compared with him. Bergkamp is a living legend at Arsenal and he was an amazing football player. "But I do not want to compare myself with anybody. I have my own style and I've had it since I was a kid. I am proud of these comparisons, but I am Mesut Ozil and I'm not finished yet." 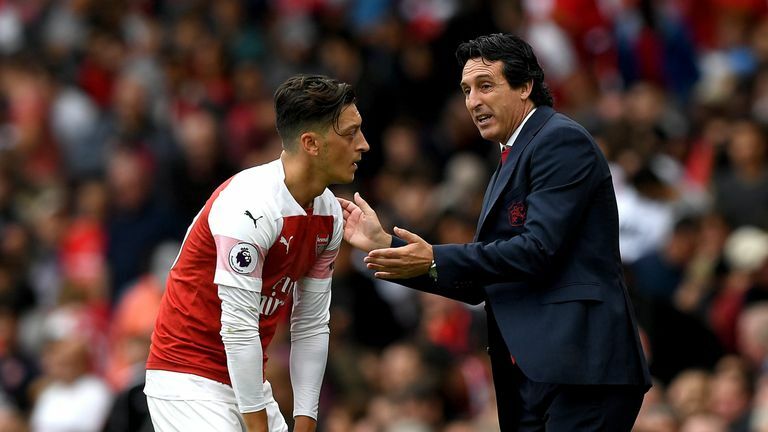 Arsenal boss Unai Emery says "there is more to come from Ozil" and has challenged him to rediscover his best form on a sustained basis. They take on Everton this Sunday, live on Sky, at the Emirates.